Calling all makers, bakers and growers! 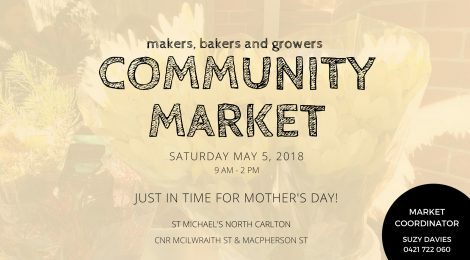 St Michael’s Community Market is a great place to show off your work! And for the rest of us, there’s food, photographs, clothing, gifts and other home-made goodies to sample and purchase. Exciting news! We have 15 stall holders signed up and a lovely folk band for background music while you enjoy really fabulous food. For offers of help, particularly in the afternoon, please contact Suzy on 0421 722 060. Tell your friends so they don’t miss out! See you there! !